June 8th – The real world?? Well here I am back in Singapore, back in the real world someone told me…! A statement which is making me quite confused. Is this land of concrete buildings, shopping malls and air-conditioned comforts the real world? Or is the world I spent the last two months in, a world of rock, ice and snow where every action was ruled by mother nature and the way she felt that day the real world?? Anyway I digress. Part of my Everest project in 2011 was to raise money for two groups, the Central Asian Institute (CAI) and HUMANEITY. I have done my bit for Central Asian Institute, and they are also running into some ‘interesting’ times in their organisation. We have raised close to$3000 for them. We also raised $1000 for the Christchurch earthquake relief fund. What remains outstanding is the project through HUMANEITY which we are sending a group of teenage school children (whom normally would not have this opportunity) from New Plymouth in Taranaki, New Zealand to a school in a developing country. Here they will witness firsthand the struggle kids born into these circumstances have to deal with on a daily basis. So far we have raised just over $3600 directly and have $7000 pledged which will be paid in over the next two weeks. Which means we have raised $10,600 which is a great effort. My target was however NZ$20,000 to get this program started which means I am only halfway there!! So this is an appeal to those people who have enjoyed reading the blog over the past two months (and I know many of you have judging by the nice emails I have received), then maybe you could consider making a small donation at the very least for the sake of the entertainment you have received! It’s very easy to donate – simply click on the link below and follow the instructions on DONATE NOW on the right hand side. Ammado is a very safe website and means to donate through. (if you are unhappy donating through the website please email me directly rawly@singnet.com.sg and we can work something out). Lastly I leave you with a photo collage video from my previous climbs around the world, accompanied by a beautiful New Zealand song sung in Maori called ‘Pokarekare ana’. I hope you enjoy. Firstly a very big thank you to David Lim for posting dispatch’s on my behalf over the last few days while I have been high up on the mountain. If I had realised he had been re-printing my fumbled, hypoxic, freezing finger created text messages from my Sat phone word for word I would have tried to make them more readable! I am now sitting at basecamp waiting to leave for the two day drive back to Kathmandu tomorrow. This will be the last blog I intend to post, so I wanted to give a final overview of these last few exciting days high on Everest. The trip from Basecamp to Interim camp and then onto Advanced Basecamp at 6350m was uneventful, however I felt stronger and more acclimatised on this walk-up than I had ever had on the previous 3 trips, all good signs that I was in good shape. Our whole schedule was aimed at summiting on the 27th May. From extensive analysis on a daily basis of the forecasts, the 27th looked like it would allow us 2 days of good weather on the 25th and 26th to get from the North Col (7050m) to Camp 2 (7600m) and Camp 3 (8300m), then allow us a perfect summit day opportunity on the 27th. We had a rest day at ABC before heading up the fixed ropes to the North Col. The north col campsite at 7050m is where the altitude really starts to make it miserable to live. We stayed two nights here , with a ‘rest day’ to acclimatise. ‘Rest day’ is a misnomer for this period. I could not sleep a wink for the two complete nights, got very bored, could not eat and felt much weaker at the end of 2 days as we set-out for Camp 2 at 7600m. My original plan was to start using oxygen from Camp 2 itself. However due to the threat of Pulmonary edema (H.A.P.E) returning, and after discussion with Jamie we decided I should go on low flow oxygen climbing from the North Col to camp 2 as an insurance against H.A.P.E. So I loaded up a 4kg bottle of oxygen into my backpack and asked Nima Sherpa to turn on the flow for me, then set-off up the fixed ropes towards camp 2. Immediately I felt awful, claustrophobic and suffocating and could only move at a shuffle. 5 steps maximum at a time then I would be bent over gasping for breath to a point I wanted to vomit. “I thought oxygen was meant to make things easier rather than harder” I thought to myself. After two hours of this struggle I was ready to turn around, I could not keep going and was still a long way from camp 2. I collapsed into the snow and rested while Jamie caught upto me and had a discussion in Nepali with Nima, Nima as it turned out had set my oxygen at 0.5 l/minute. This is fine if you are resting or sleeping – not if you are working hard though. At Jamie’s advice Nima cranked it up to 1 l/minute and immediately I felt the difference. I stood up straighter and could move at a very slow but continual pace uphill, without the need for the emergency stops every 5 steps. It was a good introduction to using oxygen and I kept a close eye on my own flow rates from this point forward. That night at Camp 2 I slept on oxygen. Not that I had beautiful uninterrupted sleep, however I managed to finally catch some rest, much better than the north col where for the previous two nights I had got no sleep. The next day we set-off for Camp 3. With my oxygen cranked upto 2l/minute I slowly plodded up the fixed ropes. Without meaning any dis-respect to Mt Everest, the climbing from North Col to Camp 2, and Camp 2 to Camp 3, is perhaps the most boring, tedious, painful and exhausting climb I have ever done on a mountain. Not steep enough to make the climbing technically demanding or committing, yet not gentle enough to be a walk it is an awkward climb where I can never break into a comfortable movement of crampon technique. It is easily the most physically demanding and exhausting activity I have ever performed. The effort required to move each foot higher is a huge mental and physical battle. You move for 5 steps until you feel your lungs will explode, then stop, rest and pant for 20 – 30 breaths. During this time your whole body tells you that you cannot go any further, you must turn around, it is impossible to move any higher. Gradually as your breath returns you realise you may be able to move again – then slowly start off on another torturous 5 steps. And so the cycle repeats – hour upon hour upon hour. Arriving at Camp 3 at 8300m, the highest campsite on earth, was just an incredible experience. The relief at arriving there after 7 hours of self imposed lung tearing exhausting torture was too much for words. As the snow started falling we crawled into our tents and lay there sucking on our oxygen. Trying to think through our oxygen starved brains about what was needed to be done. At this height one thing at a time is all that can occupy your mind. We had arrived around 4PM, and were scheduled to leave around 11:30PM that night on our summit bid. There is so many things to do in this time. Get into the tent, change into warmest clothing, melt water, drink as much as possible, prepare gear for summit push, turn on sat phone and send update to David Lim, try and sleep or rest for at least 30 minutes or an hour. All tasks which seem trivial and small when sitting at sea level, however when lying in a freezing tent at 8300m tethered to your oxygen mask, thinking slowly and hazily through your hypoxic brain they become major chores to be dealt with one by one, deliberately and slowly with many rest stops in between. Getting ready to leave for the summit push requires at least 2 hours preparation time. Thus at 10PM after a 45 minute doze, I woke to begin the 101 tedious tasks to prepare myself to climb to the summit of the world. Immediately I noticed a problem. The tent was being buffeted by strong gusts of wind. “why is this happening? We have been waiting for ten days for this summit window and there is meant to be no wind”. It was also bitterly cold. We had ice and snow built up over everything single thing inside our tent. It was definitely not the summit morning we had hoped for however as I heard no sign of postponement over the radio from Jamie I continued my preparation. Luke my tentmate had struggled desperately over the last 2 days with a stomach problem which had robbed him of all energy and he had only just made it to camp 3. Thus he had made the wise decision to not attempt the summit this morning. So I started through the tedious list of preparations: open chemical hand and feet warmers( at least 2hrs before departure) – at this height they don’t activate properly due to lack of oxygen so I need to take off my oxygen mask and hold the hand warmers inside the mask to drench them in oxygen in order to activate the chemical warming process (during which time I drift away into a hypoxic daze), melt ice to fill water bottles, eat something hot (almost impossible), drink at least one mug of something, fill pockets on down suit strategically with camera, sunscreen, energy bars, toilet paper, water bottles inside suit so they don’t freeze, put on climbing harness while lying down in tent (not easy), unfreeze boot inners, put on boot inners, put on outer boots, change oxygen bottle to new bottle, check jumar and climbing accessories, put on neck gaitor, balaclava, inner gloves, head torch, spare head torch, and so the list goes on. All these things are done while lying horizontally, squeezed in a tiny tent, in -25 degrees, where hands out of gloves freeze in a few seconds. By 11:30 I was ready to leave the tent. This is when things started to go wrong. I needed to switch to a new oxygen bottle. However the valve on the new oxygen bottle I had was filled with ice and I could not screw the regulator on it. After trying many things clumsily with my gloves on I finally resorted to taking off the gloves and taking out my hand warmers and holding then around the valve which slowly started to melt the ice. After ten minutes off this melting and me blowing hard into the valve the last piece of ice came free and I managed to screw the regulator on. My hands were very cold by this stage. Checking the dial on the regulator I was horrified to see that the bottle I had just plugged into was only half full. I personally was allocated two bottles for summit day. On 2 litres per minute this would allow me 8 hours of life saving oxygen per bottle. One for getting up the hill and one for getting down. (Some other members has opted for additional oxygen). Running out of oxygen is not a good option high on Everest. It generally means you will stay forever within a few feet of where your oxygen finishes. Thus I was pretty upset to see the dial only registering half full and immediately got on the radio to request if there was another full bottle somewhere I could use. Once I got a full bottle and had everything plugged in, I stepped out of the tent into the bitterly cold and windy night. Next step was to put on crampons. Once you are wearing a bulky down suit with balaclava and hood over your head with an oxygen mask covering your face, your vision becomes severely impaired. Especially looking downwards to your feet. As I bent over to fix my crampons on my feet I realised my crampon straps had frozen. With my hands in gloves I could not get the straps through the buckles. I shouted to Nima through the howling wind to ask him to help me. After some time struggling away on his knees Nima also gave up. “F$%K” I screamed for not the first time that night. Resorting to the inevitable I took my gloves off, crouched down and started working on the straps. Slowly I got the straps tightened however it really froze my hands further and by this time they were very painful. After 30 minutes of climbing, my fingers were extremely painful and I knew I had to do something about them. I stopped climbing and allowed Jim and Ismail to delicately pass me on the ropes, then had a very quick discussion with Jamie. “I am going down – need to rewarm my hands” I screamed to him. “OK – you just had a bad start, this wind will drop down in 2 – 3 hours time, go down re-warm your hands and start again” replied Jamie. So down I retreated to the tent and dove back in – much to Luke’s surprise, then began a painful exercise of re-warming my hands. Jamie’s news that the wind would drop in 2 -3 hours heartened me and I planned to warm up then start again when the wind dropped. As I sat in the tent with Luke listening to the radio traffic between Jamie and the climbers it started to become apparent the wind was not subsiding. We got news from lower on the mountain that Andrew Lock had aborted his oxygen-less attempt around mid-night – he was starting from Camp 2 in an attempt to summit that day and was reporting wind gusts of close to 100km/hour which were knocking him off his feet. Radio comm’s with Jamie told us it was desperately cold and windy on the ridge, thus I was not motivated to get out of the tent to start to re-start my climb. Ismail then made a very wise decision to return to camp, fearing the risk of frostbite to be too much. This turned out to be a very wise decision, made by himself personally without being forced, and as it turned out he returned with minor frost bite injuries to his face. Further comm’s with Jamie revealed the wind was definitely not dropping and that the danger of frostbite was becoming much to high. He made the decision to re-call all the climbers. What unfolded over the next few hours seemed to be the sequel to “Into thin air” as I witnessed first hand the decisions that individual climbers and sherpa’s driven by complete inexperience, personal ambition or commercial benefit make at high altitude. Jim Morrow was the next to turn around. If anyone on our entire expedition deserved to summit it was Jim. Humble, experienced, tough, completely honest and sincere, Jim is a true outdoors man who was here for completely the right reasons, because he genuinely loves it. 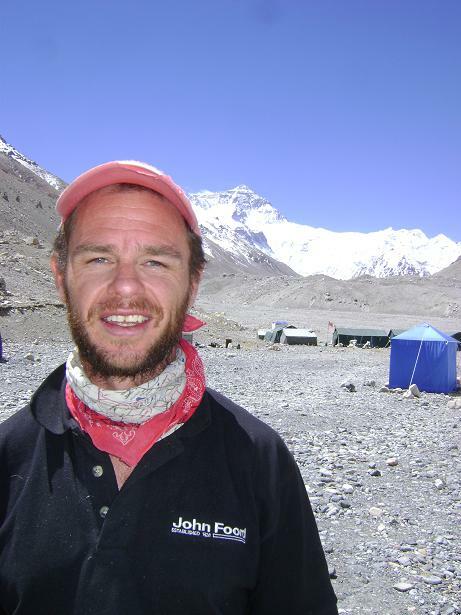 At 60 years old, Jim came to Everest with completely no ego, I never once heard him complain in 2 months and with higher blood saturation levels and lower resting heart rate levels than any other team member(i.e meaning he was basically one of the fittest) he deserved his chance to stand at the top of the world. Unfortunately with all Jim’s outdoor experience he slightly misread the signs and returned to Camp 3 with frost-bitten fingers. That left only two climbers, Esther and Ken. They were the only two from our group who were climbing with the support of personal sherpa’s. As they were relying completely on their personal sherpa’s for radio contact with Jamie they were not in direct contact with Jamie themselves. It seemed their Sherpa’s were either failing to understand the message to turn around or making their own decisions, with one sherpa turning off his radio completely which did not help communication. As I sat in the tent and felt the wind and snow buffeting the fabric, I got the news from lower down there was storm coming in for the afternoon. This sent a chill down my spine. If I had been a gambling man I would have immediately placed a large amount of money on the fact we were going to have dead teammates by the end of the day. How could they not make the decision themselves to turn around? Could not they not tell that they were still so far from the summit that by the time they got there they still had to get all the way down? Could they not tell the weather was not getting any better and that the afternoon could be worse? Some quick mental calculations in my head on the time made me realise that they would be reaching the summit in a time of around 12 hours. 12 hours – the time drilled into our heads time and time again by Jamie that after which most people will die on the descent. It was a scary and frustrating time. The issue with climbing Everest – is not so much of getting to the summit. But is one of getting back down safely. If you get in trouble then it a terrible risk of life for teammates to try to come to rescue in bad weather especially above 8000m. Thus as I have said from day one – on Everest, it is your responsibility to be independent and confident of getting to the top and back down again yourself, so as not to put other people’s life in jeopardy. Fortunately the message finally got through to Esther and her personal Sherpa Kami and she turned around. This was too late to save the damage that had already been done to her face, and she lost vision in one eye and frost bite to a large area of one side of her face. But she made it back to camp 3, and was short roped into Advanced Basecamp the next day. That left Ken still heading to the top. My details are sketchy of this as around this time,I had made the decision to head down the mountain with Ismail and Luke and lost contact with what happened. I had spoken with Jamie about the option of staying at 8300m for the day and making an attempt the next day – Jamie confirmed the forecast was not good for the next day and waiting around at 8300m in the deathzone is completely not an option unless you have lots of oxygen. Thus he suggested I descend to ABC. As it turned out the next day was a potentially summitable day with lower wind – by then I was ready to shoot the weather forecasters. Ken continued to the top with three sherpa’s, had issues with his vision when his cornea’s froze, and had a harrowing descent where he had to walk in the footsteps of his Sherpa as he could not see well. Fearing the onset of cerebral edema his sherpa had radioed Jamie requesting more support. It turned out that Ken and the 3 Sherpa’s were the only ones to summit that day. It was a magnificent achievement for Ken and the 3 sherpa’s to reach the summit of the world – however a very controversial decision which cut things extremely close to the line and could very easily have turned out much worse. As we descended down from Camp 3 to Camp 2 – the snow and wind picked up again, forcing Ismail, Luke and myself temporarily into a tent at Camp 2. We brewed up and sucked back on our oxygen while looking up at the summit of Everest with worry trying not to imagine the struggle which must be happening up there to get down. Ismail was showing signs of severe exhaustion, muttering incoherently and moving very slowly. As we waited in the tent Jim, caught up to us. He also looking exhausted and did not stop at Camp 2 but continued down. Very soon I left Camp 2 and headed down also. As I moved down over the rocky section onto the 500m vertical metres of snow slope which leads down to the North Col – I saw Jim trip as he descended the fixed rope and tumble down a number of metres until he managed to stop himself. As he tried to stand again up he fell and tumbled again and slid all the way into the anchor only to be stopped by his thumb which jammed hard into the knot in the anchor. His ski pole, hat and goggles dropped out and I watched then slide and bounce their way down towards the North Col. When I got to him he was lying there, sucking on his oxygen and trying to get his breath. He was completely exhausted and very dehydrated. By now Jim (and all of us)had been awake and moving for well over 30 hours. I suggested he rappel the ropes instead of trying to walk frontwards down the steep slopes in his tired state. As Jim finally got to his feet it became clear he was too exhausted to even handle the ropes, so I set up his abseil device and slowly walked down behind him for hour after hour. We soon had a system where stopping at each anchor point I would quickly swap his abseil device over to the next rope and off he would go, backing down in an exhausted dream world. I would direct him left and right as he slowly backed down (for some reason he wanted to keep walking off the south face of the ridge). Finally we reached the North Col as the darkness fell, I finally took off my oxygen mask which had anchored to my face for 4 days solid, collapsed into the tents and slept almost the complete night – at 7050m without oxygen this is a sign of how tired I was feeling. The next day we stumbled our way down the fixed ropes from the North Col and into Advanced basecamp. I was starting to think about another summit attempt however in my exhausted state was a not a nice thought. Any small uphill rise left me crawling along pathetically slowly, stopping every few steps to rest. How could I expect to climb from ABC, another 2500m vertical metres back up to the roof of the world in this state? I could barely walk up the 5m to the toilet. It was obvious I would need a significant rest period before going high again. That night at ABC I got a check of the forecast (which by now I was becoming very sceptical of) and the news could not have been worse. Strong winds for the next ten days. The other problem was the snow. There was far too much snow on the mountain for this time of the year and more was coming every day. It should be very dry this time of the year – not covered in white powder which we needed to plow through up high. The season was effectively over. So here I am back at basecamp. Tomorrow we will leave for the two day drive back to Kathmandu. I have a roller coast of emotions. I am naturally a little disappointed. Disappointed that after working so hard for one year, training, raising money, preparing, then coming to the mountain here and struggling for 2 months, going through the nightmare of H.A.P.E and returning to climb high again, that at the end of the day, it came down to an inaccurate weather forecast and us choosing the wrong day to attempt to summit the mountain. I am also relieved, the emotional stress of going high again with the thought of having a ticking time bomb in my chest ready to explode( H.A.P.E) was mentally very tough. Now I can relax. I made a promise to Stephanie I would return from Mt Everest. That promise hung over my head every day of this trip but even more so after the H.A.P.E issue. I knew deep down that it was beyond my power to promise her this. It is such a relief to know I that I have managed to uphold this. I also definitely feel very humbled. Humbled at having the opportunity to be here and climb to 8350m on the mighty slopes of this massive mountain. Where so many great men and woman have come and gone before. But mainly now I am excited. So excited about the future ahead. Getting back to enjoy all the comforts of civilisation which we normally take for granted. Seeing Stephanie again. Watching a movie. Wearing shorts and a tee-shirt. Eating Singapore’s great food. I came to Everest and I climbed to 8350m, I got through H.A.P.E, I got through tooth abscesses, I got to the highest campsite on earth. I managed to look after myself and avoid frostbite. What is there not to be happy about? There is so many things in this wonderful world we live in I am looking forward to plan and experience. It makes me smile just writing this. Last but not least I want to thank all of you who have been with me on this journey. When lying in my tent shivering away breathing oxygen after an exhausting days climbing, it was a magic feeling to turn on my sat phone and download the warm and wonderful messages of support from so many people. Sorry I could not reply to you all. I am sorry if I have let anyone down, all I can say is I tried my best on Everest this year – I gave it everything I had. I never wanted to be dragged to the top of the world by Sherpa’s. Even if my hands had been warmer on summit day I would not have continued to the summit as I was not confident I would have able to get down again safely and it went against every mountaineering instinct I have built up over 12 years of independent climbing around the world to continue in those conditions. Right now I want away from this mountain. I want Stephanie, I want sunshine, green grass, beer, nice food and the company of good friends. That will last for a month or two until I am ready for the next challenge. Will it be Everest again? This is Axe signing out with the most sincere and humblest thanks for the last time from Everest Basecamp 2011. Day 49, May 29 – What may be happening right now…. May 29th was the date that Tenzing Norgay and Edmund Hillary climbed Mt Everest in 1953. I will leave all of Axe’s supporters and friends with a last excerpt from my 2nd book, Against Giants: The Life and Climbs of a Disabled Mountaineer – which tells of what I felt like returning to Rongbuk basecamp without the summit. I will continue update this blog for Grant until he gets back to a more reliable Internet connection where he can truly share, in depth, his adventures. Until then, cheerio! were roused by the clanging of the beating of a saucepan. and landmark brought be closer to the end of my journey. I felt a warm trickle run down my face. face and a hug signalled the end of my journey to Everest. grape-flavoured Tang and it was heaven to be back safely. Feeling a little down. At the same time, I’m very homesick and would love to get off this mountain as soon as possible. Now it’s up to the weather report and final 02 assessments. Looking forward to fishhead curry with David when I get back…Never missed Singapore so much. weather report just in: Strong winds of up to 30 knots over summit zone for the next 10 days, except for some easing off for a few hours on June 1st. This means there will be no second summit attempt. ” Just got into North Col campsite with 3 other members.We are exhausted beyond words. Had to help a team member who was too exhausted to handle the fixed rope or abseil down the ropes. Got here safely in the darkness ( around 0230am Nepal time). The weather forecast was totally incorrect today. Bloody winds. We haveat least one with frostbite. 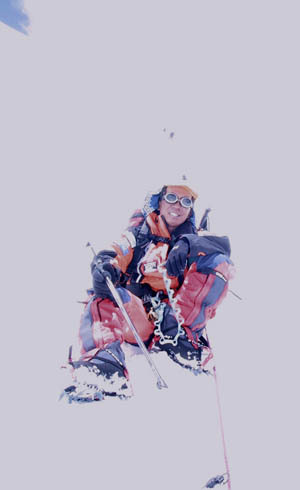 Singaporean Kenneth Koh made the summit with 3 sherpas in support but got some snowblindness from corneas freezing from the wind/cold. it was hard to get all our stuff together in time and we only left at 710am, about half and hour late. overtake me at my rest stops. European lady who was accompanied by two sherpa climbers. dictated that you were open about how you climbed the peak. effect in the building winds. tents located here, I mused, quite tired from my efforts. refused to move to the commands my brain was sending down. guide, summitted at sunset and descended in the darkness. difficult situations on the peak. option to him. I took a few deep breaths to clear my head. strength to complete the climb up. chance to climb Everest. It was heartbreaking. stopped him. His down suit was slashed in a few places. collapsing, dressed as I was, into a deep sleep. noodles and drank some tea. We left, as planned, at 1030am. issue. The climb to the summit was over. David: You can’t sit around c3 all day dude. U got enough gas (02) to have a 2nd go there. What did Jamie ( Jamie McGuinness – team leader) say? All your bloody fans are agog with suspense! Grant: I will leave (c3) in 30 mins head back down to the Col or ABC. Enough gas I think so. Ebough of a weather window, and energy – I do not know. Am tired. Grant: Thanks Dave. Will leave soon. My Satphone can’t message Steph,so she relies on your blog updates. David: You will be less tired descending to just C2 but won’t sleep as well as on North Col. tricky decision. North Col is many hours down and will involve climbing through the night. DAVID’s EXTRA NOTE: Do not know if Grant got my last message. 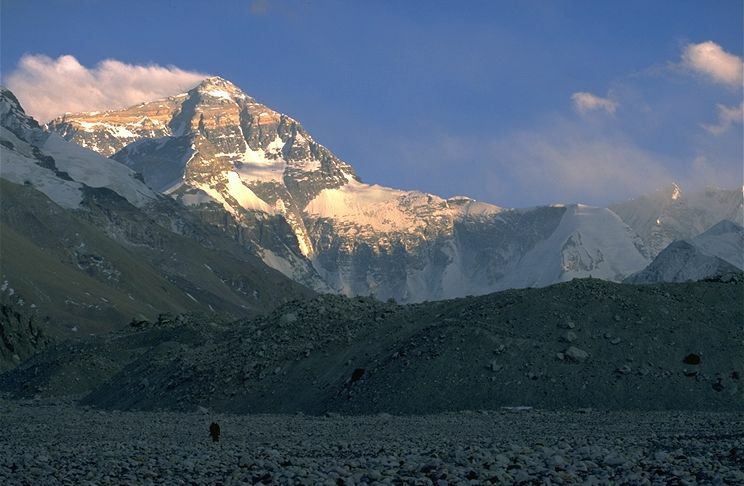 However, if he wants to descend the 700m to C2, it will take him up to 7pm to do so, assuming he left at around 3pm Nepal time; and likely to reach camp in the fading sunset light. Heading to the col is a 1300 vertical metre descent, will take maybe 6 hours or so and Grant will be downclimbing the 35-40 degree angled ridge for a few hours in the darkness and greatly fatigued. Having done such a nightime descent in 2001, I will say it’s not great and you have to stay alert all the time. Right now, the decision depends on weather windows and being position in the right place. Sleep at the Col – is probably better for recovery but it means a tiring descent today, and a re-ascent if Grant elects to make a 2nd attempt. He will get less quality rest at 7600m ( c2) but will be in a very good position for a 2-day second attempt dash for the summit if he does so. A good weather window usually opens up in the last week of May and often holds until the 1st week of June, looking at all the late season summits in recent years. I hope I hear from him once he’s safely tucked into a campsite lower down tonight. From David: That’s it for now. Sadly, C3 is not a good place at all for either getting some rest or waiting out the weather. Unless well-stocked, C3 usually has only enough food and 02 for a couple of days, and possibly not enough spare stuff for a 2nd summit bid. It really depends on how much redundancy a team wants to build into their plans, and also the physical condition of the team. In my experience from two previous Mt Everest expeditions, including the 2001 north ridge expedition, there are few options now but to descend to at least North Col. However, time and supplies are probably running out for the team, and a 2nd attempt will be dependent on 1) the weather and time/return flights, 2) 02 and supplies at C2 and C3, 3) mental and physical shape of those wanting a 2nd go at the summit. Pray for a safe return. Day 46-47 – SUMMIT DAY (#47) CLIMB! Go Grant! David’s Note: My pal Jim WIlliams from Exploradus, has a team going for the summit. The news from the South Col at 1945hrs on May 26th was clear and calm – perfect evening for starting a summitpush. Hopefully , condiitons on the north side of Everest are also similar! David’s note: The route to the top involves some tricky traverses and rock scrambling over a number of rock “steps”, themost notorious being the 2nd Step – near where Mallory and Irvine were last seen before the clouds covered them from view forever that June day in 1924. Grant’s route will cover the 1st and 2nd steps – the latter involving a aluminium ladder in place since 1975 and pretty creaky. The exposure to your right can be phenomenal, and it is totally different climbing than on the more open ridge on the south (Nepal)side. AFter teh 2nd step, the 3rd step is small by comparison, and then a just a few tricky slab avalanche prone slopes to traverse before the summit. In crowded situations, there is a risk of being stuck behind a bottle neck of climbers coming up or down. Grant is likely to leave around midnight or a bit later – considering that there is at least 300 fewer vertical metres to climb than the south side start from SOuth Col at 8000m. However, there is a lot of horizontal ground to cover. So as I write this at 0030hrs, it is most likely Grant is already out of his tent, looking at a clear sky, and sucking deep on his oxygen mask as he braves the start of many steps to the top of the world. Go, Grant! Rest day here at North Col (tuesday) – sunny mixed with snow showers. hard to have proper rest here, and dreading another restless night staying awake. Sittingout the bad winds , and hope to make the climb to 7600m tomorrow (wed). May 21 – Arrived ABC ! arrived at ABC feeling good.Resting a day here before heading up for North Col. Summit news coming in – first teams from the North summit this morning. Death toll: 1 on the north side and 4 on the southside ( season total so far). I watched a nepalese paraglide from the summit thismorning. Sorry for the repeat message however I left my Sat phone number off the last message by mistake. Please only send me Sat phone messages once I leave for higher camps from the 21st onwards. And be sure to keep them short (less than 120 characters) and enter your name as well in the required field so I know who it is! For 99% of the that time the reality of what I have been training for seems too distant to specifically focus on. Until suddenly the time comes when you are standing on the side of that rugby field, trying to block out the sound of 20,000 screaming people while you wait to run on and play or are standing in the shadows of the boxing ring waiting for the announcer to call your name before you step up, or as I am now, preparing to leave tomorrow to head up on the final push to reach the top of the world. The experience becomes lonelier and lonelier as the conclusion draws nearer. The realisation that at the end of the day, with all the support I have had up till now – it is ultimately me and only me who must step up and perform, push myself beyond what I know is possible and put all those months of preparation and training into practice. And finally a HUGE thank you to all of the people incl. friends/family and those I don’t even know personally, who have followed my progress, sent me encouraging emails and comments and cheered me on from the sidelines. It has been an enormous boost to my moral, especially when things have not been going well. Whatever happens during the course of the next ten days, I will be giving every last drop of my energy, my commitment and my spirit. If I do or do not make the summit, whatever is meant to be. All I wish for is that Everest will be kind enough to allow me to retreat back down her mighty slopes safely so I can return home. David Lim, based in Singapore will keep you updated on my progress up the mountain as we move higher and higher. Tomorrow (20th) we will leave for Interim Basecamp, the start of the journey. It will take us around 6 – 7 days before we can reach the highest camp (Camp 2 at 8300m) and be in a position to go for the summit. Attached is a photo of expedition leader Jamie McGuinness discussing the summit plan with our sherpa team here at basecamp this morning. The Sherpa’s are an amazingly loyal, strong and key component of all expedition’s here. We have a very small team of sherpa’s supporting us compared to some expeditions, however they are extremely experienced, hardworking and great company with their cheerful and open personalities. Over and out from basecamp Everest for my last and final pre-climb blog! P.S: I will be able to receive messages of support by email/blog for the next 24 hours. Received an SMS from Grant from Intermediate Camp at 5700m. Apparently, he trekked up there in a quick time of 3 hours, and is feeling strong. He will push up to ABC tomorrow, May 17th. And then make a day hike up to North Col before coming down to ABC, or BC depending on how long a day he wants to have. Well at this stage a possible weather window does not look like it will open up until at least the 26th May. Bearing in mind we need to leave a number of days before summit time to move up and get into position, this could potentially mean we would start around 21st May from basecamp here. All these dates are completely hypothetical at this stage. What it does mean is that there is a number of days which we need to stay fit and acclimatised before the summit push. Hence today I am leaving to make another round trip up to interim and advanced basecamp, probably for maximum 3 nights. Depending on the weather window I may push higher to the North Col at 7050m for a day trip. Attached is a photo of Everest taken this morning behind my shoulder. It looks so serene and beautiful from here at basecamp. The reality is that it is VERY windy high up. So much so that up high, climbing teams are pinned down inside their tents – unable to move due to the ferocity of the winds. Well I am about to go and shave off 5 weeks off hair off my face, have lunch then head off for Interim basecamp. “Well, your chest sounds clear and based on my experience you should be ok to try and re-ascend very carefully. However you have to listen to your body and at the first sign of trouble get down as quickly as possible and go home. If you do get HAPE again, it will come on stronger and faster than last time and there is very little we can do to save someone with serious HAPE in a first rate hospital in the USA let alone on here on the side of Mt Everest. The doctors words were magic to my ears. I had managed to find an english speaking doctor from another expedition who gave me a quick check over and gave me an all clear to have another go at getting higher again. As I packed my bag in basecamp in preparation to re-ascend, discussions with other people came running through my head. I tried to block these negative thoughts out as I grabbed my packed lunch off Kami the cook, said goodbye to the team at basecamp and headed off alone up in the direction of interim basecamp. As I walked the emotions of the last few days started to overflow. Intense feelings of relief, fear and excitement. Relief at getting another opportunity to re-ascend and the end of the pain of the last few days. Excitement at what lay before me and finally moving upwards again. And fear at my body’s reaction to re-ascending and the return of the dreaded H.A.P.E. For 4 hours I wandered slowly up the Rongbuk Glaciar, turning off onto the East Rongbuk Glaciar until I arrived at Interim basecamp. Walking by myself proved very therapeutic and I arrived feeling pleasantly tired, with no sign of any nausea or headache which I had experienced on my first visit to Interim Camp. I also only needed just over one litre of water to get up, as opposed to the 2.5 I had consumed on the first visit, and had still been desperately thirsty on arrival. All signs my body was much more acclimatised. After a pleasant nights sleep lying on 5 mattresses in the dining tent(the benefit of moving independently between camps away from the main group), I awoke the next day and wandered for another 4.5 hours upto Advanced basecamp at 6350m. The last hour was a grind (as anything above 6000m is) however I arrived again using only one litre of water and no headache. There was a trekking group of ten people who were aiming to reach the North Col who were sharing our Advanced Base Camp facilities. Unfortunately they had all been hit hard by the altitude. Severe headaches, rampant stomach problems, nausea, complete lack of appetite and extreme lethargy lead to a very sorry site of 10 people staring quietly at their food and not touching a drop during the evening dinner. After a rest day at ABC, only three of the trekkers felt strong enough to even attempt to make the North Col. 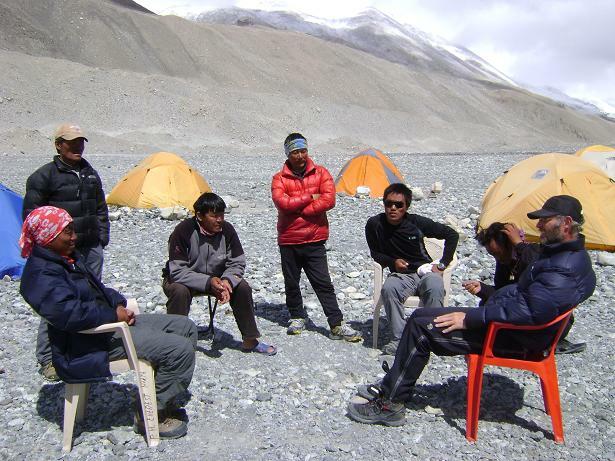 The rest of the team had staggered weakly down to basecamp, some arriving well into the dark, dehydrated and miserable. The trekkers were not the only ones getting sick. Nima Sherpa – my guardian angel who helped me down the mountain when I got hit with H.A.P.E also succumbed to Altitude sickness on the North Col and had to descend to A.B.C to rest and recover for some days. The next day I tagged along behind the three trekkers as they attempted to head upto the North Col. Arriving at the fixed ropes the snow also started to come down and I soon left them behind as I started jumaring up the lines. Ascending the fixed ropes for 400 vertical metres to the North Col is one of the most exhausting things I have ever done. At an altitude approaching 7000m every step up is a fight. As the snow came down the ropes began to freeze and my jumar (or ascender) started clogging up with snow and stopped working. It slid down the rope more easily than it slid up the rope! As the climbing got steeper I would carefully balance on my crampons and unclip the jumar off the rope, clean out the ice built up around the teeth of the jumar with my pocket knife, then re-attach it again and continue up the rope until it lost traction again a few meters later when I had to repeat the process. After 3 hours on the fixed ropes I had arrived at the last obstacle – 2 ladders tied together over a large crevasse and an ice wall to traverse up and around to reach the tent sites. Attached is a short 2 min video clip of myself ascending the ladder. It is quite unstable and definitely not a good place to fall off. Apologize for the background static noise, which is interference between the radio and the video camera. By this time the three trekkers had decided to turn around halfway up towards the Col and were heading back down to ABC. 20 mins after my arrival at 7050m at the col, Luke turned up and we located our expedition tents and jumped in. Unfortunately the one we chose looked as if someone had lobbed a stick of dynamite inside and zipped the door shut. Half eaten bowls and packets of food, pools of water on the floor, half full pee bottles and sleeping bags and gear strewn wildly all over the place. 7000m is a place where people concentrate more on surviving than the niceties of life,including cleaning up after themselves. Trying to sleep(and survive in general) at 7000m is a brutal experience. We spent the night melting snow and drinking brews then lying in our sleeping bags resting. I think I managed around 30 minutes sleep as the longest run. It’s just a terribly uncomfortable and difficult place to try to function as a human being. The morning could not come quick enough and with our down suits on we moved 200m out onto the North Col proper. Here one is exposed to the full force of Everest winds (the tents on the North Col are partially sheltered by an ice wall). What a brutal experience. As I was not prepared on this acclimatisation cycle to climb higher than the Col, I was not dressed appropriately. The wind howled and froze my face almost instantly. I needed wind goggles. Wearing my down suit my body was too hot yet my head was freezing! It was an awe-inspiring experience that once again increased my level of respect for this mountain. Wind and cold which would literally freeze any exposed skin very quickly. After 30 minutes we slunk back with our tails between our legs to our tent, packed our gear and descended the fixed ropes back to ABC camp. The next day I awoke at ABC feeling refreshed and decided to head all the way back down to Basecamp for 2 or 3 days of rest. It is possible to rest at ABC(6350m) however you do not get stronger, and as the doctor warned me – “no amount of mental fortitude or strength can stop the biologic decomposition of your body which occurs above 6000m”. Therefore even though it’s a tiring 17km descent all the way to Basecamp at 5150m, your body is better off in the long run as it can rest and re-cover slightly better at this level. So in 5 hours I wandered all the way down to Basecamp, with my Ipod playing away in my ears. What a difference to a few days before when I had made the same journey with H.A.P.E in a marathon 11 hour effort. Every step down the mountain as I got lower and lower I felt my strength returning. To most people coming up to arrive at basecamp for the first time it would seem like an inhospitable, barren place with thin air. However after spending time at 7000m at the North Col, coming down to basecamp seemed like an oasis and I relished the thought of a hot shower and 2 or 3 days of rest in the thicker air. In the shower (i.e. a bag of hot water with a hose), it was a shock to see how skinny I had become. At this stage most teams have finished their acclimatisation rounds and are all in the same position. Waiting for a weather window, where the winds will drop down to a level low enough to allow a 5 day push to the summit and back. This weather forecasting is not an exact science and takes some ‘interpretation’. At this stage it is still unclear when this window will be. The other factor is that the rope fixing teams on our side (the North side) have not yet managed to fix the rope’s on the upper sections of the climb due to strong winds. Naturally all teams are waiting for this very important job to be completed also before they can think of attempting a summit push. There have been some Everest summits from the South Side(Nepalese side) of the mountain in the last few days. Yesterday apparently 30 climbers and sherpa’s managed to summit Everest from the south side. The south side is more sheltered from the wind and an entirely different proposition than climbing from the North side here in Tibet which is much more exposed to the wind. It’s not only a weather window which allows you to get from the high camp to the summit and back which is important. It is a large enough weather window which allows you to climb to the high camps themselves. Just getting to camps 2 and 3 at 7600m and 8200m respectively is an enormous challenge in itself. An exhausting, brutal struggle which requires all things in your favor, especially wind speed lower than say 20 knots(ideally we are looking for only 5 – 10 knots). It really is now a waiting game and a test of mental strength. The temperatures warm up towards the end of the month, so later summit push’s statistically have less chances of climbers getting frostbite. However the longer we wait at basecamp the more we lose acclimatisation, and the more our strength and fitness slowly ebbs away. Mentally by now after spending close to 40 days on the mountain, people are starting to feel mountain-tired. Tired of sleeping in tents, tired of not washing, tired of the freezing nights, tired of the food etc… It’s a time when climbers just want to get the job done and get out of here. Thanks again for all the messages of support and its nice to hear so many positive responses from people and to read all the messages of support. The summit is a very long way away and every day I question if I have the strength to make it. This really is an enormous mountain and an enormous physical challenge to even make it to 7000m, to the North Col where I have been so far. All I can do is give it my best shot and take one step at a time. And if the opportunity presents itself then make a dash for the summit. Until then its wait wait wait and look at the weather forecasts. Heading for a night at North Col (7000m) from ABC this morning. Not bringing the Satphone. Hope my HAPE wont recur.. But so far, feeling strong and healthy. It’s hard work living above 6000m. David’s Note: From ABC, the path meanders up to 6500m whereupon the glacier begins. A gradual rise up to 6600m, andthen a steep er 35 – 45 degree snow/ice wall beckons. A fixed rope is usually already in place, and the North Col campsite is often sheltered under an ice ‘wing’ – essentially, an overhanging wall of ice. To the left , you will be able to see the snaking north ridge going up to the 7600m campsite, often referred to as Camp 2. From there, on bottled oxygen, most climbers will climb up the nixed rock sections to Camp 3 at 8300m; from which summit attempts are then launched. Hi, moved up from IC from Basecamp yesterday. Feeling strong and hope this feeling stays. Today I’m moving to ABC at 6400m, and hope to then push up to NOrth Col. Then back to ABC for some rest and then up again to North Col for the final pre-summit acclimatisation cycle. The slightest recurrence of HAPE, and I shall be running back to basecamp and to Singapore.